I recently found out about a really awesome pancake stall in Penang and have been dying to go back there. So the six of us went back there for dinner and as usual, check out the amount of food we consumed at this place. Taman Lip Sin is located in Bayan Lepas area in Penang and this is a very heavily populated area for the locals. When I was there at the hawker centre, the whole place was super busy with people eyeing for tables despite the fact that the centre was huge with lots of table and also lots of various hawker stalls. Overall, there are some really great food, with some average and minimal ones. The centre has at least more than 40 food stalls hence the choice is huge. Business is brisk but food arrives quite fast as well. He is a super busy man as he works non stop at making his specialty. He also accommodates to special request and his partner lady also works fast to wrap up the orders despite long queues. With ten plates going on at one time, this man has his operations flow like a smooth river stream going at super fast speed. I tell you hor, his pancakes is summed up in one word – Sensational! Check out his main ingredients all lined up ready for his hot pans! Lots of peanut butter, corn, chocolate sauce, cheese and many other yummy ingredients. Ah…crushed peanuts and thick sliced bananas, all piping hot slowly resting on soft batter crisping up on the hot plate. Owner is super generous with ingredients. You will be spoilt for choice with Aki as owner is very creative and fills his pancakes with lots of creative goodies. I ordered few Peanut, Brown Sugar and Corn pancakes and two Tomyam Cheese pancake. See how the ingredient oozes out of the nicely brown pancake batter? This is super addictive as the brown sugar aroma is really fabulous! Lots of roasted crushed peanuts and sweet corn kernels, I could eat a few pieces of this if I don’t eat other stuff. The brown sugar is marvelously fragrant and really adds a gorgeous dimension to the pancake. This is my favorite combination and I order this every time I go to Aki’s. I decided to go adventurous and try his Tomyam Cheese version. The pancake was layered with ooey gooey cheese and filled with sliced mushroom, shredded ham and onion cooked in tomyam sauce. I quite like this as the tom yam sweet and slightly sour sauce seems to go well with cheese and the pancake surprisingly. I would order this again if I crave for tomyam. I have also tried ham and cheese and also the crispy cheese on last previous visits. Both were also super delicious and lip smacking awesome! One good find here is the Char Koay Teow. This is certainly a popular one as I saw most tables having one plate! Nice wok hei and taste is lovely with the added lap cheong and big juicy prawns. ‘Oh Chien’ or Fried Oyster Omelet… this is a masterpiece! First time I see so many oysters on the dish. Most sellers skimp on the oysters and I think it was only RM 7 for this portion. Fresh super luscious baby oysters were magnificient! Cooked perfectly with equal balance of starch and egg, the omelet also has ‘ku chai’ and a great chili sauce to enhance the overall flavors. My 2nd favorite dish after Aki pancake. Another recommended dish is the Fried Stingray. Yummylicious to the end! Well seasoned and flavored with the spices and chilies, the stingray was fresh and cheap. Lots of meat and the accompanied chili sauce with fresh shallots were spicy and sour with a kick. I love this fish as it was really cooked beautifully. Belachan Fried Chicken was ok. Crispy and juicy, the chicken was average as I didn’t really get the belachan oomph in the taste. Belachan Tofu was also average. Its quite unique as this is my first time tasting belachan tofu but taste was a bit bland. The chili sauce did nothing for the dish. Taiwan sausage was just deep fried. I don’t think one can screw up this sausage. Penang Loh Mee was also normal. The dish tasted ordinary as the flavors were just not strong enough compared to my favorite place for Loh Mee. Popiah or Fresh Spring Rolls was another ordinary dish. Nothing stands out as it tasted average. Penang style Jellyfish Salad was not to my likings. Sauce was diluted and just sweet. The ingredients were average but the crispy cracker was good though. We ate other stuff as well but my family devoured the dishes before I could take a photo! We had fish & chips, curry mee and asam laksa. All three dishes were quite good as well. My advise is do go there early as there is always a queue at Aki Pancake. Owner is nice to give his phone contact for you to call and check if they are open or order. Don’t forget to order a popular Penang drink called ‘Pat Poh’. It’s actually a famous herbal drink made from eight ingredients to cool the body. Aki’s Pancakes is a must-have for me when I am in Penang. Cheap and filling with quality ingredients and magnificent flavors, what more can one ask for? Go straight for Aki’s Pancakes and eat it hot! 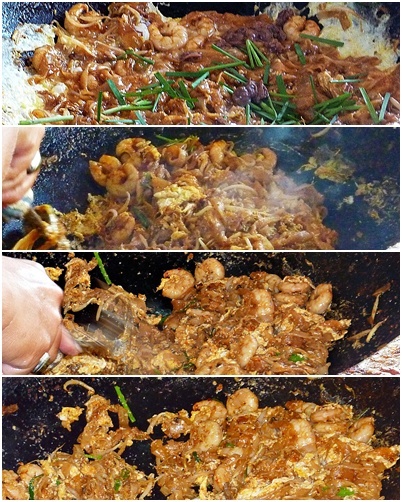 Ah….Char Koay Teow (CKT), one of the most highly debated and talked about dish in Penang! There are CKT worshippers everywhere who swear by their own preference of which CKT is the best of the best. There are also so many versions available from basic simple to luxurious and jazz up versions of this dish. People are willing to queue up and wait for 45 minutes or more for a plate of this legendary dish. CKT is stir fry flat rice noodles doused with a special soy sauce concoction and chili. Prawns, cockles, ‘lap cheong’, beansprout, ‘ku chai’ and egg are its usual accompaniments that give it the famous taste of CKT. Every seller has its own secret and method of producing their own version. Despite its similar ingredients in most of the CKT, I can vouch that no CKT is the same as it depends on the skill and recipe of each CKT seller. With this standard, I set out to check out the much blogged super famous Ah Leng Char Koay Teow in Khoon Hiang Café, Penang. This super legendary CKT was started by Teoh Koon Leng, 70 years old now, and the stall is now being helmed by his children. Mr Teoh also makes a comment that there is a slight difference in the CKT between his and his children. Since I was feeling full from breakfast, I decided to take away the CKT for later. I arrived at Khoon Hiang around 10am and was told that there is a wait of 40 minutes as there was already a huge stack of orders in queue. Mom thought I was nuts to wait so long but then she complied because she knows that I am determined to taste this before I leave Penang. Owner busy at work frying up plates after plates of CKT as it’s actually hard work and this can be physically tiring and hot. I stood there for 40 minutes and he did not even stop for a minute! I notice that there is this banner that says the owner has another shop at night at a different location. This must be the original shop from the father as I read it somewhere in the paper recently. Prices differs as it depends on what ingredients you wish and since I was determined to go all the way, I decided on the super extra ingredients and went for the most expensive version at RM10.50. Huge prawns, prawn mantis and duck egg was the extra ingredients for this special plate. Needless to say, mom was shocked and speechless…hehehe! Let me show you the stages of how the pros stir up a good plate of CKT! This is the standard plate of Ah Leng CKT which was just plated hot off the sizzling wok after I took the step by step process above. The take away version of the super extra ingredients CKT. Four fresh juicy huge prawns and quite a few pieces of prawn mantis was the star of the dish! Prawns were really fabulous and huge. It’s like the Rolls Royce version of CKT… hehehe. I thought the prawn mantis was a bit mushy but it did enhance the seafood taste of the koay teow. Duck egg added the sinful eggy goodness to the dish. Since the CKT was also wrapped in a piece of banana leave, the smell was unbelievable. I savored the rice noodles slowly to enjoy the richness of the koay teow with its ku chai and cockles (which was overcooked due to the take away). Mom cheekily asked me if it was worth the wait and $$? I replied with “Oh yeah! I would do this all over again.” Definitely 99% of my picture perfect CKT. Luckily I am not staying in Penang else I would be patronizing this very often. If you are not a fan of CKT, there is still an economy rice stall at the same café. Plenty of locals were helping themselves to the wide variety of home cook dishes available. My mom did a take away of this and said the dishes were quite good. Ah Leng CKT really lives up to its name from my experience. This CKT worshipper is now convinced that this is worth the wait and price for a fabulous plate of CKT. The owner and its helpers were really nice too unlike some CKT stalls I know. I would definitely go back but this time, I would like to eat in to get the taste of the hot off the stove CKT. I think one plate is not enough for me…kakaka! After dinner one night during the CNY holidays, there was bad traffic everywhere in Penang. We were near Gurney Drive area stuck in traffic when suddenly my family suggested to go for desserts. As we were near the area, sister quickly suggested a hidden dessert place along the famous Gurney Drive for their specialty of crepes. We slowly inch our way in the horrendous traffic to this café. If no one had told us about this, we certainly would not have known about this place called Crepe Cottage. 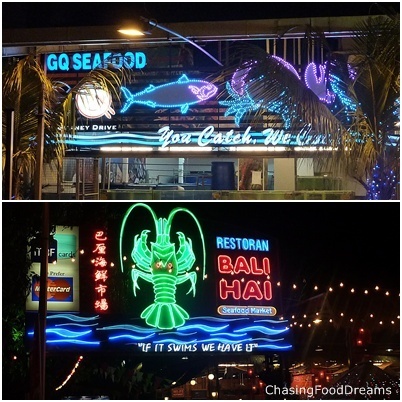 Gurney Drive was well lighted with bright neon lights on cafes, restaurants and even on trees! When we were there, there were people lighting up paper balloon lanterns which will float up to the sky once the heat fills up the paper balloons. It was certainly a really beautiful sight. I didn’t manage to capture a good picture of this but it was certainly a simple science logic to the floating lanterns. Check out the gorgeously lighted up neon tree! Somehow its quite eye catching with its flowers and multi color lights strands. Plenty of seafood restaurants along this famous road catered for tourist rather than locals. The quaint little house called Crepe Cottage that creates scrumptious crepes specialties and ice creams. It is actually a very old house with a basement for which the owner does all the cooking there. Small family run business, hence one needs the patience to dine here. The café is not really obvious unless you are looking for it. It’s also quite small with only a few tables in the air conditioned space but there are some open air tables. During peak season, the queue is long for tables and food due to the limited space and chef. When I checked out the menu, I was surprised that it also has a decent menu for western food filled from soups and seafood to even pasta! Most of the items do incorporate crepes, hence this makes it quite unique. We quickly put in an appetizer and three desserts. We found out the quaint little place was owned by a lady named Agnes and we could see her and I believe her children assisting her in running the place. Water was quickly placed on our tables but food only came after 50 minutes later! While waiting, we kept eyeing other tables that were having dinner and were drooling at their western food. We told ourselves to come back for dinner at this place one day. Next up was Coconut Parcel (RM6.00). Now this is heavenly awesome and I was on cloud nine! Simple thin crepe wrapped around a huge scoop of good vanilla ice cream with bits of fragrant toasted coconut flakes and plenty of fresh whipped cream. Float away with this simple and really divine dessert. I wanted this whole dessert for myself and we all fought over this with great fun. Mom surprised us by ordering Hot Apple on Ice Cream Crepe (RM9.00) as she is not a big fan of ice cream. This is another masterpiece dessert! Warm slivers of apple compote sitting gloriously on a crepe wrapped vanilla ice cream and adorned with plenty of whipped cream again. The beautiful cinnamon coated fried apple compote was perfectly cooked to tenderness without being too soft and over sweet. Sigh…I stole quite a bit from mom although I do not like my apples cooked. This is a must order as it reminds me of apple pie and vanilla ice cream where warm and cold is a perfect match in dessert. Nephew ordered Chocolate Crepe with Nutella and Banana (RM10.00). This one was average for me as I do not like banana but the chocolate crepe and ice cream was lovely. My family loved this one and polished this off on their own with me stealing some chocolate ice creams and some Nutella sauce. Salute to the chef for her creativeness and skills in perfecting crepes in so many ways! * Still more Penang food crawl on its way.. When I was still in lower school, my super nice dad would wake up early morning, go for his usual exercise and rush back to ‘ta pau’ this lovely char koay kak (CKK) or fried radish cake for me from this special uncle in Macalister Lane. Uncle’s CKK was really de-li-cious and special as it was wrapped in banana leaf and smell awfully sinful in the wee hours of the morning! This was a luxury to me as I always look forward to this breakfast from dad. Sigh..after all these years, memories of this are still so vivid to me...dad passed away for almost 20 years already but I can still remember such small and simple things of the past so clearly. Lucky me get to sleep in and my lovely mom ‘ta pau’ lots of breakfast for me on the 3rd day of CNY for me. She surprised me with the same CKK from the uncle and I was ecstatic with joy! Now if you are wondering how come uncle is still around, sad to say but uncle has long passed away as well, but his daughters have continued his legacy of churning out the beautiful CKK! You can find the stall in front of Seow Fong Lye Coffee Shop in Macalister Lane. See how uniquely wrapped the CKK is? I don’t think I can find a cone shape packaging anymore for CKK, especially in KL. This is traditional packaging done by the uncle since I was small. This CKK stall has been around for more than 30 years! Truly a masterpiece and I sincerely hope the legacy continues. Another popular stall in this area is the Chee Cheong Fun (CCF) managed by an elderly couple. I don’t really recall having this during my early years but this stall always has a queue. Some customers even stand at the stall for self service dine-in to quicken the pace as the elderly couple appreciates all the help they can get. Another quick tip to get your order faster is to not unroll the CCF. I never like my CCF unroll anyway. Simple steamed rice noodles with a luscious dark and sticky sauce of prawn paste, sweet sauce and chili sauce with a dash of sesame can really bring wonders to your palate. This dish relies a lot on the sauce, hence the elderly couple really concocted a well balanced sauce mixture for the soft rice rolls. Sweet and pungent from the sauce, this was heavenly to my taste buds. Penang Curry Mee is another unique dish for us Penangites. KL curry mee has a rich and thick soup laced with spices and thick coconut milk often served with a side of curry chicken and some vegetables. The Penang version has a coconut soup that is thin and whitish in color with a layer of curry oil. The taste is sweeter and lighter on the spices and fragrant chili paste and oil is doused to fiery up the soup. The curry mee here is also served with prawns, plenty of bean curd puffs (soft and less meaty), cockles, cubed coagulated pig blood and slivers of brown squids. I love this version and the stall at Seow Fong Lye has a good curry mee stall too! Well balanced in taste and ingredients are plenty, this really hits the spot for me. I had the full dish of CKK and curry mee, a few bites of the CCF and then sister opened her packet of Stir Fried Tanghoon. Sigh…sneaked in a few bites of that Fried Tanghoon as well. Stir Fried Tanghoon was average but I love the pungent sambal belachan that goes with it. It really brings up the flavors of the noodles. After that enormous breakfast, one would have been super full to the brim but guess what? Sister bought some piping hot Curry Puffs and pre-packed Nasi Lemak from Pulau Tikus market. Sigh…cannot resist curry puffs and nasi lemak! I walloped a whole piece of curry puff and stole a bite of nasi lemak from my niece…hahaha. Curry puff (RM1.50 per piece) was still warm and very flaky. Filling was really meltingly tender and lip smacking good! The curry puff was almost as big as my hand and there was a sizable piece of chicken meat in it. Just too good to resist and I was bursting by the time I finished this puff! Check out the simple Nasi Lemak that cost RM1.50 each. Topped with half a boiled egg and some anchovy sambal, this was also good and had a beautiful aroma of the banana leaf. How come food smell so good with banana leaf? My mom was Horrified at me for chomping down the huge breakfast and sister piped in to announce she also bought fresh and crispy Fried Banana and Nian Gao! Luckily I am not a fan of banana else I would have taken a few more bites of that. Check out the crispness of the fried items! My sister said they were really yummy as everything was crispy and not oily. Mom warned me to stay off lunch and said she will not buy so much breakfast anymore as she didn’t expect me to polish this off at one go. Kakakaka…Sometimes I amazed myself as well! Business hours: 7.30am to 1pm daily. *Still more Penang food crawl to come..
Penang Island, my hometown, has been listed in several lists from magazines and blogs for its unique fusion of cultures and food. I m very proud to call Penang my hometown and would love to be able to retire here one day. During the CNY holidays, I returned home to the island as usual to spend some time with my family. As usual, I would have planned some must haves when I hit the food paradise of the island. Since it’s the holiday, I am hoping some of the places would be open for business. I was craving for a good plate of char kway teow and koay chiap since I don’t seem to find a good one that I like in KL. I remembered my dad used to like this koay chiap stall in the older area of Penang. This koay chiap is the only one he would eat as he declared this to be the most consistently well flavored koay chiap in Penang! Koay chiap is basically a flat rice noodle (kinda like koay teow but in short pieces and not as oily) soaked in a very dark flavorful braised duck and pork soup with spices. 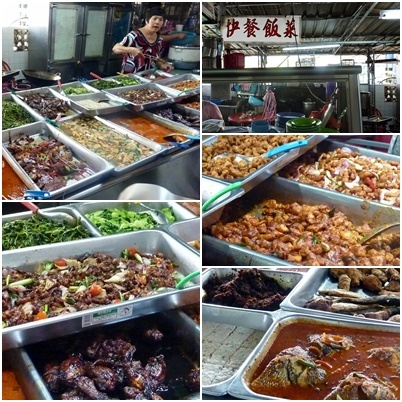 This koay chiap stall has been around for ages and is located in Kimberley Street. It is only open for business at night and tends to be super busy even on non holiday season. Locals know to get there early as the koay chiap tends to get sold out early on busy days. The owner makes everything from scratch from the rice noodles to the chili sauce within his family members. The quality is very consistent and one can always expect nothing less but perfection from this stall. The ingredients on the stall are just the tip of the iceberg as I saw more stuff being brought over later on to add to the brisk business. My piping hot bowl of Koay Chiap. The koay chiap comes with shredded duck meat, some offals and half a braised egg. I just loved the soup. The aroma is really luscious with hints of cinnamon and star anise. Dark, tasty and simply delicious, I drank every bit of the soup. The rice noodle itself was soft and slightly chewy with its accompaniments of the tasty shredded duck and chopped offals, it is really comforting and brings back memories of my Dad. I can have two bowls of this except I was saving room for some other goodies. The garlic chili sauce was really a perfect match for the soup and its ingredients. Sigh…with happiness! 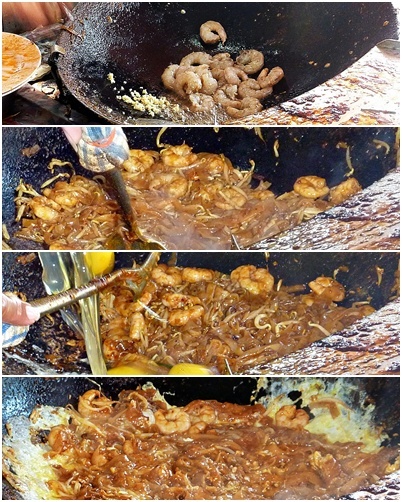 Besides koay chiap, I had heard much about the char kway teow with prawn mantis in the same area. Game to try this, I guess I had too much expectation for it. Another surprise was that I saw a very young man busy stir frying the kway teow. I was expecting an older man but thought maybe its son took over. I was informed that they do not have prawn mantis as it was the new year, hence they offered fried fish pieces as a substitute. I took one look and denied the fish and ordered a regular plate of kway teow. There is something distinctive about the taste of Penang char kway teow (CKT) which I cannot find in KL. The taste of the lightly seared pieces of kway teow full of wok hei and its soy sauce with chili and prawns is just so satisfying. My plate arrived and it looks plain. I had read about a wait for this CKT but I guess I was wrong as my plate arrived few mins after ordering. The CKT had some wok hei but I find it did not live up to the expectation of what I had read from other blogs. It just doesn’t look the same as other blogs. Then it occurred to me that the original stall may not be open due to the holidays and this could be an impersonator hoping to rope in some business? Or could it be the owner’s son standing in for his dad? Anyway, the CKT is ok and tasted average. Business is still brisk for the CKT stall though as there is a few people waiting for it. One can sit comfortably in the Sin Guat Keong Coffee Shop and order the food in unless you like the dark narrow side lanes among the stalls. Another popular stall is the Dessert stall which has a few various tong shui. There is the popular leng chi kang (longan dessert soup), red bean and almond tea with yau cha kwai. We ordered an almond tea with the yau char kwai. This was good as the tea was really yummy and consistency was thick enough without being too gooey. Yau cha kwai was fresh, crispy and delicious! *Stay tune for more Penang Food Crawl..